WABASH – Not many expected Tippecanoe Valley to be there, much less, be there. 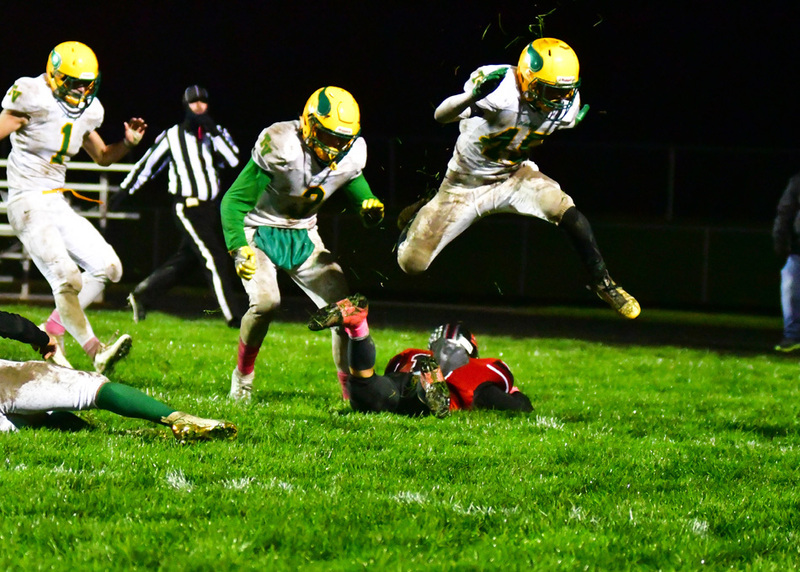 Some late heroics on top of some even later heroics saved for quite a storyline as Southwood pulled a few rabbits out of its hat in a 21-20 comeback win in overtime at the Three Rivers Conference championship game Friday night. 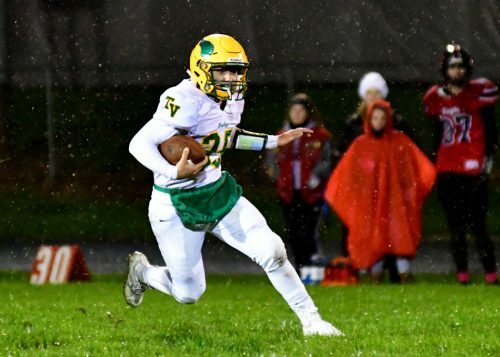 After a very rocky 2017, combined with a 1-3 start to the 2018 campaign, not many thought Tippecanoe Valley would be one play away from a conference championship. With 17 seconds left on the clock in the fourth quarter, that’s where the Vikings were as Southwood was down to its last bullet trailing 14-7. The Knights were facing goal to go from the four, and called on its workhorse, Gabe Lloyd, who rumbled the last four yards for the touchdown. Southwood went for two, its first attempt was good but called back for a holding penalty. The Knights settled for the point-after-try to tie the game at 14 and force overtime. Wes Melanson works the ground game for the Vikings. Valley got the ball first in the overtime session, and on fourth down, Wes Melanson smashed through the Southwood line for a two-yard plunge. The extra point attempt, however, was partially blocked and no good. Southwood again was down to its final bullet, facing fourth down and the championship on the line. Rather than going to the obvious, the Knights ran a misdirection and threw a screen to Carson Heath, who found the wedge and the goal line for the score. Jackson Simons’ extra point went through to end it. Heath, who had dropped three passes earlier in the game and was temporarily benched, will go down as the hero for the undefeated 9-0 Knights. But Southwood got a fight from Valley it hasn’t seen this season. Held to just 51 yards in the first half, Southwood looked mortal entering the lockerroom tied at 7-7. Coming into the night, Southwood had outscored its opponents 257-29 and only Maconaquah was the lone opponent to post double digits, barely getting there in a 21-10 loss. Southwood had also never trailed this season before Alex Morrison found the endzone on a one-yard run on fourth down with 2:42 left in the third quarter. Valley had the prime field position on that drive after Southwood’s punt hit the back of an upback and was gobbled up at the Knights’ seven-yard line. Southwood got on the board first when Lloyd scored on an eight-yard run on its second possession. Valley responded in the second quarter with a long drive that had its running game carve up the Knights’ defense. Morrison ended the drive with a two-yard bust into the teeth of the vaunted guard to tie the game and send red flags up all over the usually comfortable Southwood sideline. Viking quarterback Noah Miller finds room to run. The win for the Knights puts them back on the championship throne of the TRC, winners of the intra-divisional game in 2017 over Northfield. 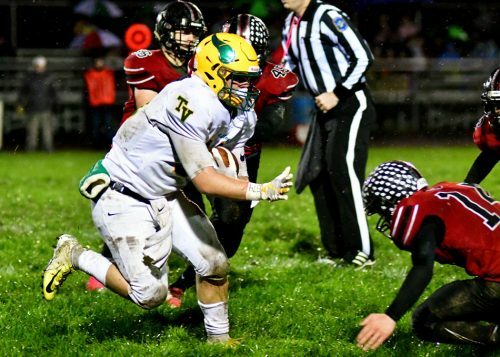 Tippecanoe Valley hasn’t won a TRC title since it split with Rochester in 2011 and 2012. The moral victories won’t likely surface until practice on Monday, but Moriarty won’t shy away from what his team accomplished. In what was a driving, freezing rain for most of the game on a field with grass half a foot tall, it was tough sledding to move the ball. Valley had just 211 yards of offense to just 187 for Southwood. Cam Parker led the Valley rushing attack with 21 carries for 58 yards and Morrison had 32 yards and the two touchdowns. Noah Miller had 92 yards of total offense running and throwing for the Vikings, both of his completed passes going to Morrison for 73 yards. His interception in the fourth quarter, however, on a third down panic throw to avoid a sack, set up the tying Knights touchdown. Miller was also picked off deep in Southwood territory in the first quarter on an errant pass. Lloyd led the Knights with 66 yards rushing and Alex Farr added 60 yards on the ground and 45 yards passing on three completions. Valley (5-4) will focus on next week’s opening round matchup in the Class 3-A Sectional 27 at Peru. The Tigers (0-9) lost to Manchester 66-7 Friday night and have allowed at least 34 points in every game this season. 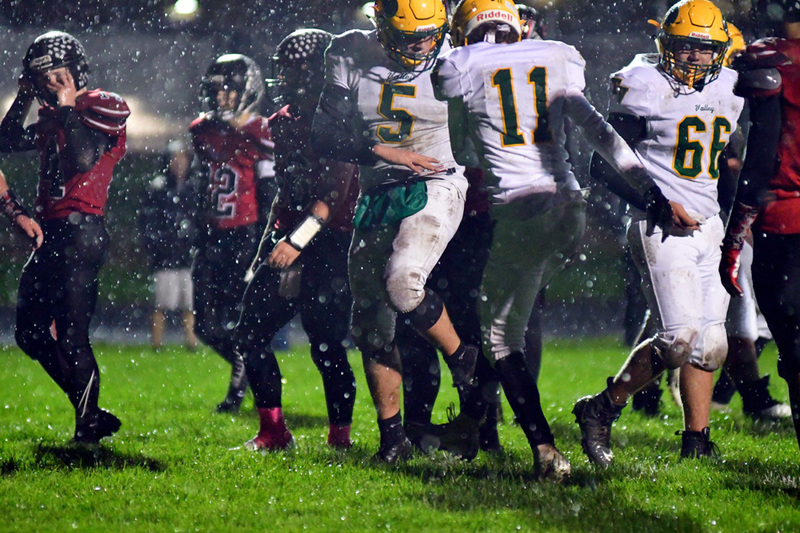 Tippecanoe Valley’s Alex Morrison (5) and Jalen Potter (11) celebrate Morrison’s first touchdown of the night against Southwood.